What is in store for the Tibetans in 2018? As we know, 'people's well-being' has been the leitmotiv of the Chinese regime. Xi affirmed that all rural Chinese living below the poverty line would no more be poor by 2020. In the meantime in Tibet, the authorities have taken so-called ‘welfare’ measures to 'help' the common men/women. Unfortunately these measures are often …with Chinese characteristics. The article explained: “Cards are no longer needed to withdraw money. A quick scan of the face will do.” Already 20 ATMs with facial recognition technology have been installed, 14 in Lhasa and the others, elsewhere of Tibet. Of course, it is entirely for the benefit of the ‘masses’! It is certainly convenient for the Public Security Bureau officials to identify those who would be tempted to question the supremacy of the Party. Already, 100 new ATMs have been tested; they will be put in service in a couple of months. In the meantime, China is building a giant facial recognition database to identify any citizen within seconds. It is said that the project can achieve an accuracy rate of 90 per cent …but it faces concerns about security. The fact that the project was launched by the Ministry of Public Security shows that it is not just for ATMs and other ‘welfare’ issues. It is also said that the promoters have been encountering difficulties partly due to the technical limits of facial recognition technology. But there is no doubt that these difficulties will be overcome. The data entry continues in the most remote parts of the Tibetan plateau. 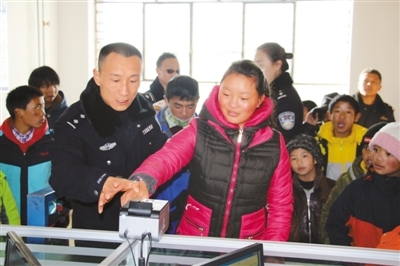 The reporter added that “to solve the document handling problem of children in welfare homes in Ngari Prefecture, green channel is opened by the local police station of Shiquanhe [Ngari] Town with more simplified processing procedure." In 2018, the facial data of each and every Tibetan will be stored. The Generals are back ...and out? Did the Young Horse tame the Dragon?